At Camp Lei Suves (4 stars), near the Mediterranean region in Frejus-Monaco we offer very neat mobile home on a nice quiet and very child-friendly campsite. The camp is located in the town of Roquebrune-sur-Argens, near the beautiful sandy beaches of Frejus on the Cote d'Azur, not far from Saint-Tropez, Sainte-Maxime, Saint-Raphaël and Cannes. 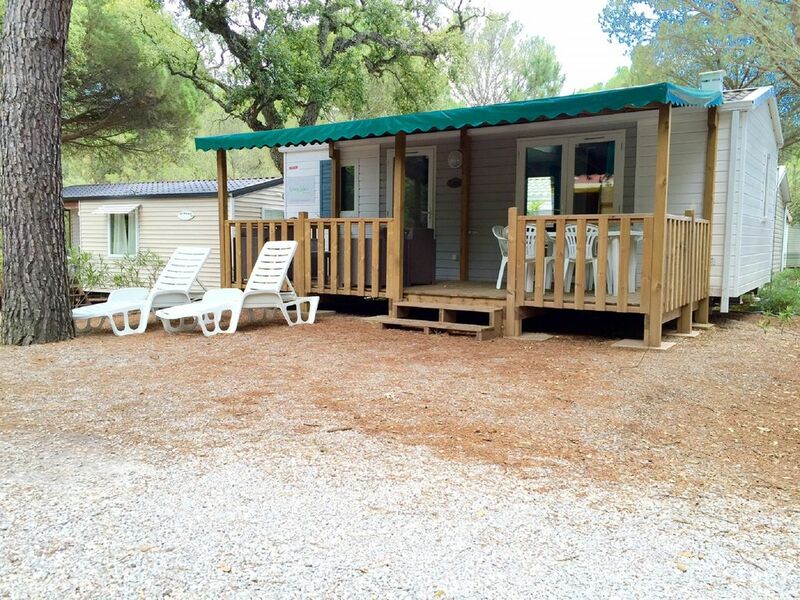 The camp is located amidst a cork oak forest, past flowery paths, you will feel at home and spend a wonderful time. The pool is heated so you can enjoy the first sunbeams. Ideal for those with children the nature or the peace search in combination with a luxury campsite where lots to do. The mobile homes are all on spacious plots and have a big wooden deck / porch where you have views over the campsite and the beautiful nature. Classification of the caravan, the caravan has 2 bedrooms, 1 bedroom with a 2 bed with large storage cupboard. And 1 bedroom with two single beds also features a built-in closet. The windows are all equipped with blackout curtains and drapes. Furthermore, the caravan has a bathroom with sink and shower with glass door. Separately there is a toilet. The living room consists of a kitchen (with fridge-freezer and a microwave / oven) and a sitting area. If they can not be converted into a spacious 1 bed (5th person). Camping Lei Suves is located in Roquebrune sur Argens, near (8 km) the beautiful sandy beaches of the French Riviera, near Frejus, Saint-Tropez, Sainte-Maxime, Saint-Raphael and Cannes. There are two heated swimming pools on the camp site. The site is ideal for families with (young) children and is a delight for nature lovers. Almost all homes are of English or Dutch owners. There is also a very nice restaurant with good value for money. Also, all types of meals can be picked up. There are also several pétanque courts, tennis courts and may be disposed at each mobile home on the internet.